You would keenly agree with me that the best way of getting an improved and increased yield from any crop production venture is through the use of fertilizer. In a simple term; a fertilizer is any material added to the soil to increase its fertility; hence, the definition of the word fertilizer is not limited to the synthetic ones we are familiar with. A good example of fertilizer is the Compost manure; it is an organic fertilizer. Compost manure is the decomposed remnants of organic materials. Compost is simply an organic material made from waste materials; it is majorly made from plant materials but at times, some animal materials. The use of compost manure is beneficial to both the soil and the crop; apart from adding fertility to the soil, it conditions the soil, aids the activities of microbes and also helps to improve soil structure. Do you know that the soil is a living thing? The soil is a living thing and you have to treat the soil like other living things, like your siblings, so to say. Just like every living thing, the soil possesses prominent characteristics. Soil breathes, eats, and reproduces. A good example of soil food is organic manure, which compost manure is a part. If you eat you will grow, won’t you? Soil also grows. This can be noticed in their structure and texture. The best way to enhance the living of the soil is to constantly serve its food, organic manure. If the soil is healthy; you can get a good yield from the crop planted on it. Organic fertilizer is the best fertilizer used to maintain and sustain the soil. This basic understanding will guide you on how to enrich your soil for better yield. Compost manure can be made from any waste material but the duration varies with the nature and type of the ingredients used in its preparation. The duration of compost manure is dependent on the nature of the ingredients used; some compost takes about 4 months or more but the one am about to share with you takes just 4 days and you have your compost ready to boost the productivity of your soil. Also, you need a compost bin or a compost pit. Compost pit meaning is the same as compost bin because they serve the same function; they serve as the site of operation, where you prepare your compost. Compost pit is a permanent structure; it looks like a pit where you prepare the compost; while the compost bin is mobile and durable but limited in the quantity of compost it can accommodate. Therefore, you can choose from any of the two “sites” for your compost manure preparation. The highlighted ingredients are all you need to get your compost prepared within four days. These materials are cheaply available at little or no cost. The poultry manure is the waste gotten for poultry birds. Spent or staled mushroom compost is the second material; If you can’t get spent mushroom compost, I mean the spent substrate of mushroom farming, then replace with 1 part rice bran and 1 part wood shavings. Also, you can replace molasses with melted sugar or honey but of course those are expensive. Note: Molasses is a waste product from sugar processing companies. Make the molasses or sugar or honey into a solution by dissolving the 2litres in 20litres water. Which other ingredients might not be easy to come by? I guess it’s the Effective Microorganisms. OK.
You can replace the effective microorganisms with fresh moist virgin forest soil. Lastly, do not be confused about the issue of the “parts” attached to the items. The part is just to tell you the relative proportion of these ingredients to get the desired result. The part can be in the form of a kilogram (kg); where you have two parts, use 2 kg and where you have half part, use half kilogram. Is that gotten? Yes, you are good to go now. Once your ingredients are set and your site is ready for use, follow the steps as described below to get your compost manure done. Make piles of these ingredients; one thin layer after the other, while wetting or misting each thin layer with the molasses solution each time. You can divide each ingredient into three parts and use one third for every layer. After making the piles, turn the piles to ensure all ingredients are thoroughly and homogeneously mixed. Cover with airtight plastic compost bin (the site) and keep under shade for protection. After 4 days, your compost is ready for use. Your compost comes out with a sweet wine smell, anything other than that like a bad rotten or foul odor means your compost is not well formed so you have to try again. Now, you’ve prepared your compost and it is ready for use. So how do you apply? Compost manure is best applied using the topdressing method of fertilizer application. You can as well apply the compost as a mulch on the plant. Or you plough into the soil during land preparation. The compost supplies nitrogen into the soil and other essential nutrients needed for plant growth. Aside from replenishing the soil nutrient, the compost manure also helps to improve the soil structure, hence, providing an enabling and favorable environment for the soil organisms to thrive. 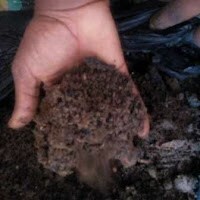 Compost manure is highly recommended for sustainable agricultural practice and organic farming. It is a cheap way of improving the soil quality and conversely increasing crop yield. Kindly share using the share button below and subscribe to our posts.